When we got back to Caracas after our travels we stopped by FUNVISIS to pick up some luggage we had left. After that Pnina and I made our way out of Caracas and back to the coast via the scenic route. A small collection of U-turns allowed us to get from where the picture below was taken to the base of those mountains on the other side of town. 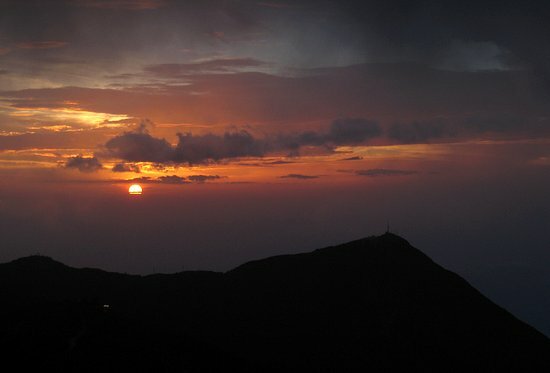 The scenic route, Avinida Boyacá, runs right along the side of the Parque Nacional El Ávila (which is the mountain range below). It also took us to an intermediate destination...one more cable car ride! 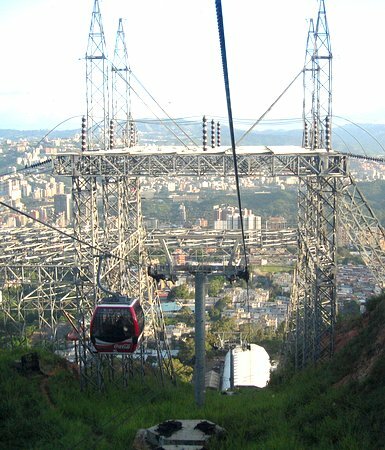 The Ávila Cable Car was built in 1957. When I was in Caracas in 2001 it was not running, but they were working on it. US$180,000,000 was spent getting it, and the park area at the top, the Parque Ávila Mágica, up and running after 20 years of being shutdown. 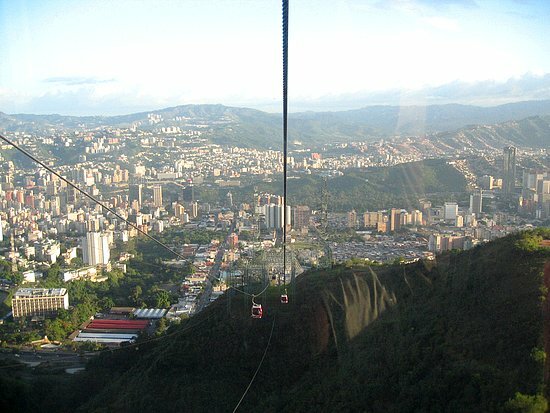 The cable car starts in Maripérez and ascends from 1000 meters (3280 feet -- the elevation of Caracas) to 2100 meters (6889 feet) roughly to the top of the peak, El Ávila Peak (the peak in left portion of the picture above), and the Humboldt Hotel. 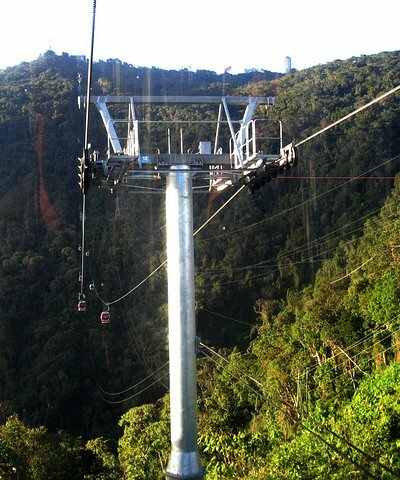 The original system had another teleférico running from the top of the mountain down to the city of La Guaira on the sea side (north) of the mountains. There are plans to restart that line too. 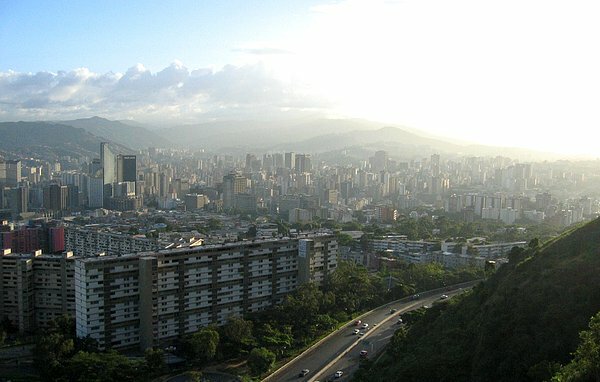 Below is the western part of the Caracas valley with Avinida Boyacá, or "Cota Mil" ('1000-meter level') as it is also known. 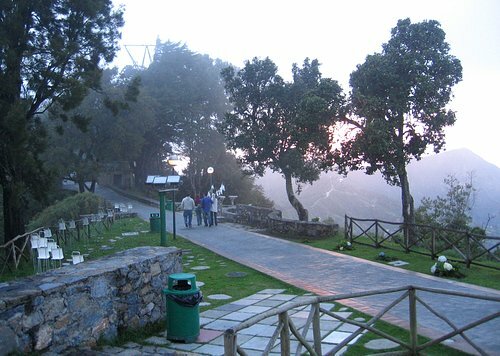 Above 1000 meters in elevation is the park. The cables, and you along with them, travel through some high voltage transmission line towers. That could be exciting during a thunderstorm. Coming up on the last long stretch before reaching the top. The ride was nice in that once you left the stations there was practically no noise from the equipment. At the top there is a restaurant, vendors and a lot of information about the plant life. The Humboldt Hotel. Is the cable car the only way up? 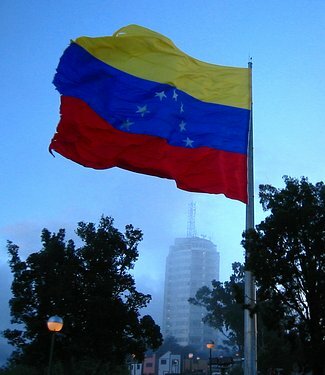 So, for me at least, it was almost time to say "sayonara" to Venezuela again. I headed for Colombia the next day for about a week and then returned to the Caracas airport, but only to stay the night, and then head back home the day after that. As usual -- all two times so far -- Venezuela was a great place to visit! Just like last time -- Venezuela still didn't look like jungle I thought it would, but it was closer this time.